“Will you bring the children for Easter and Christmas?” Mrs. Patricia Yackley asked me, as we sat across from each other at her kitchen table. “Children? What children?” I thought to myself, then, after a thoughtful pause, I realized she meant the children I would be having with her son, whom I’d only been dating for a month. That was the first time I met my (then future) mother-in-law. Right from the start, I could tell she was a warm, funny, open-minded woman with a huge heart. 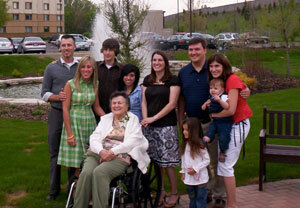 Pat and Bud Yackley (Bud passed away three years ago) raised five children in a traditional Catholic home. All the kids attended Catholic elementary school. The eldest, Luke, was studying to become a priest, but decided to marry and have a family, and later became a deacon. Pat does the rosary every day, without fail. My husband Mike says that his mother knows all the Catholic saints. Crosses, crucifixes, and pictures of Jesus adorned almost every room. It was obvious, from the get go, that this was a religious family. Then in I walked–the Jewish girl. Pat doesn’t remember our first conversation around the table, but recalls having a leg up on me, as Mike told her, after our first meeting, that he’d met the girl he wanted to marry. Pat has always embraced me with the love she gives to everyone in her family, and when we adopted our daughter Rebecca, whom we had already decided we would raise in the Jewish faith, Pat’s bottomless love was always there for her. One manifestation of this Catholic grandma’s love for her Jewish granddaughter was her creation of the “spring basket,” in lieu of the traditional Easter basket. Filled with packets of seeds, gardening gloves, candy, plastic eggs filled with coins, little stuffed animals and more, it wasn’t so much what was in the baskets that made a difference. What conveyed the uniqueness and depth of caring expressed by my mother-in-law was the fact that she took the time to come up with even a different name for the Easter basket, in an effort to make it inclusive for her granddaughter. Pat also made a point of giving Rebecca Hanukkah presents each year, even when we gathered around my in-laws’ Christmas tree. Recently I asked Pat one of those questions I’ve wondered about since Mike and I married, just over 20 years ago: Does she worry about our souls? Does she worry that we –Rebecca and I–won’t go to heaven with Mike? As a family, we are fortunate in many ways. I am blessed with a fabulous mother-in-law, and my husband, who gets along famously with both my parents, is blessed, too. It certainly didn’t hurt that my mom (and my dad, as well), adored Mike from the moment they met him. And like Mike, they may very well have hoped, from the get-go, that I’d met the man I was going to marry. Over the years, we’ve had many holidays and life-cycle events we’ve shared between our two families. My in-laws came to the synagogue for Rebecca’s baby naming ceremony, and enjoyed meeting everyone and being part of our Jewish community for her bat mitzvah. Pat invites my parents to join us at her home for Christmas dinner every year, and everyone exchanges Christmas and Hanukkah gifts. She mails Rosh Hashanah cards to my parents, and they mail Easter cards to her. Each year they all comment about how they receive the best cards from the other. These days, Pat’s four sons and daughter, and their spouses, her 11 grandchildren (plus four step-grandchildren), and her 9 great-grandchildren, are all lucky to have Pat in their lives. She lends an ear to everyone, she never judges, and she’s always quick to share a laugh. Even the staff and other residents in the senior apartment complex where she lives, repeatedly tell us how wonderful she is, and what a joy she is to have around. We all think she’s fabulous! 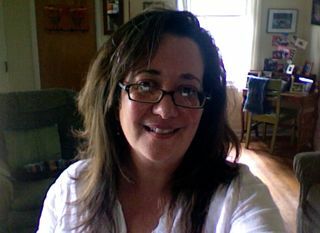 Rachel Baruch Yackley is a freelance writer, nonprofit administrator, educator, mother and wife. For over 13 years, her articles have been published in newspapers, magazines and online. Rachel also leads services, song leads, teaches religious school and volunteers with Fox Valley Jewish Neighbors in Geneva, IL.